BEIJING- Leaders of some countries and international organizations have sent messages to China, congratulating Beijing on its successful bid to host the 2022 Olympic and Paralympic Winter Games. In a congratulatory message sent to Chinese President Xi Jinping, Kazakh President Nursultan Nazarbayev said that Beijing’s winning of the bid once again shows China’s huge development potential. Nazarbayev believed that China will hold a successful, high-standard 2022 Olympic Winter Games and carry forward the Olympic spirit further. Kazakh Prime Minister Karim Masimov also has sent a congratulatory message to Chinese Premier Li Keqiang, saying Kazakhstan is willing to work together with China to make contributions to the development of the Olympic movement. In his congratulatory message to Xi, Russian President Vladimir Putin believed that Beijing will hold excellent 2022 Winter Olympic Games just as it did in the 2008 Summer Olympic Games. He said that Russia wilk offer full assistance to China in the preparation process for the Games. Russian Prime Minister Dmitry Medvedev also sent a message to his Chinese counterpart to congratulate Beijing on winning the bid to host the 2022 Olympic Winter Games. In addition, leaders of many other countries and international organizations have, in various ways, expressed congratulations to China’s successful bid for the 2022 Olympic Winter Games. 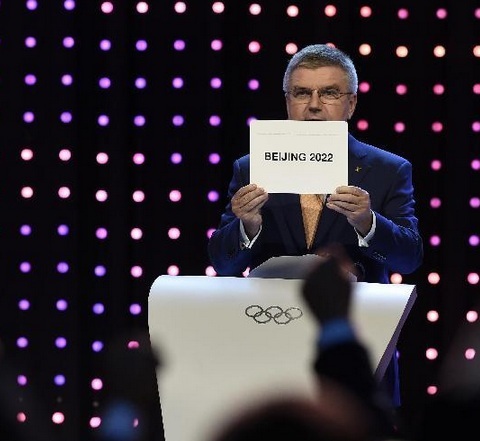 Beijing, together with Zhangjiakou, a city in northern China’s Hebei province, won 44 nods against rival Almaty’s 40 in the International Olympic Committee vote in Kuala Lumpur Friday afternoon to host the 2022 Olympic and Paralympic Winter Games.